You can even roast your pita into chips and eat it as a snack the options are endless really. Just like with soft vegan flatbread or chickpea flatbread it makes you wonder why you want to buy pita bread in the store. 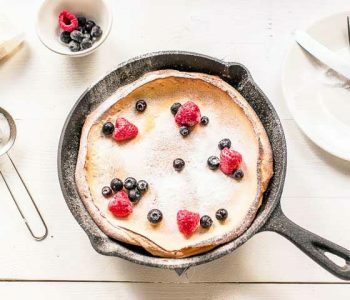 Because honestly homemade tastes so much better! 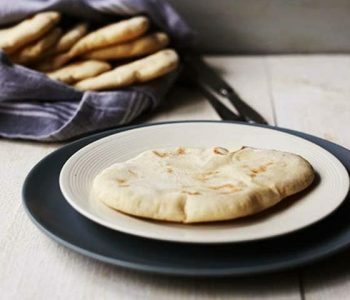 It takes quite some time to make but when you taste this homemade pita bread you know it is really worth to make your own. Of course buying is way more convenient. I get it, I buy them in the store as well. However I do keep a special stack in my freezer to use when I want to make my recipe extra delicious. This applies to my tortilla recipe but also for this pita bread recipe. Buying pita bread in the store is just fine but if you want the most perfect pita bread this is your recipe. 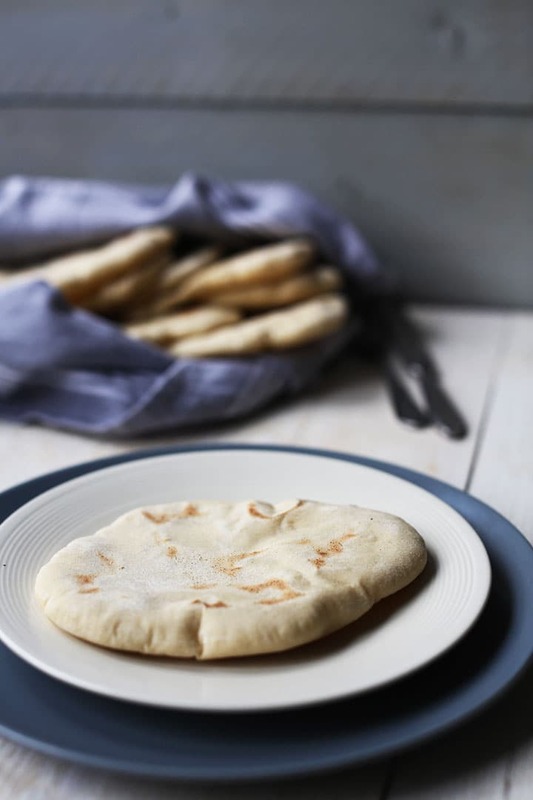 If you want to make this pita bread recipe you need a number of basic ingredient that I ‘m sure you have in your pantry or kitchen cabinet. 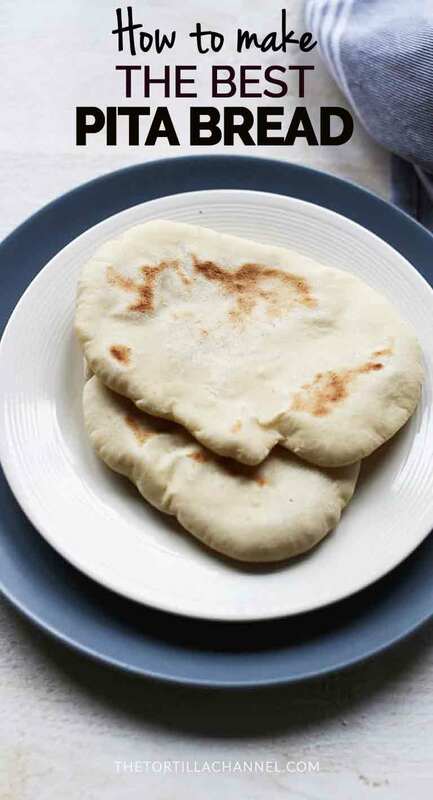 To make the best pita bread you basically need to apply 5 steps. If you follow those steps your bread ends up looking so appetizing you want to eat them straight out of the oven. One of the secrets to perfect pita bread is yeast. Use a new packet or fresh yeast to be sure the dough can proof properly. As soon as you open a packet of instant yeast the quality deteriorates. So if you use an open packet check to see if it is still active. You can do this by making a separate yeast mixture and combine the yeast, sugar and warm water. Stir and let it rest for at least 5-8 minutes. The warm water and sugar will activate and feed the yeast. So you will see the mixture froth and bubble slightly. If that is the case you have active yeast. 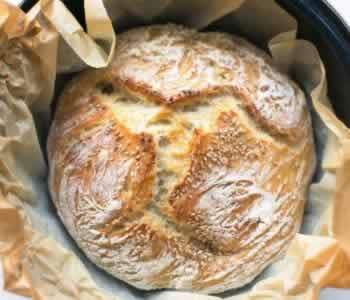 Combine the all purpose flour and wheat flower in a separate large mixing bowl. 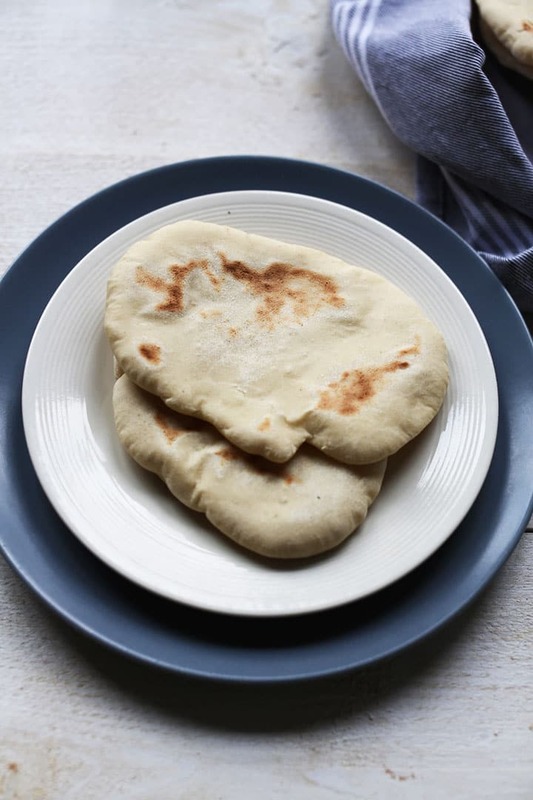 These two types of flour are the perfect mix to make perfect pita bread. The all purpose flour helps the dough become nice and fluffy. Add the yeast mixture to your flour mixture. Knead the dough for at least 10 minutes by hand or use your kitchen machine (this will require only a couple of minutes) before you let it rest and proof in an oiled bowl. Set the bowl in a draft free warm spot for at least one hour. You can use a cool oven for this. Make sure you cover the bowl with cling film or a clean cloth. Cut the dough into 8 equal pieces and roll into 8 inch circle of about ¼ inch thick. Let the pita bread proof for another 25 minutes under some plastic wrap and a wet cloth. What is also very important to good bread is the heat of the oven. If possible heat the oven at 500℉/250℃ and if you have a pizza stone pre heat the stone in the oven as well. When the oven is preheated do not put the pita bread in the oven right away. Let the oven run for at least another 10 minutes before you put the pita in the oven. That way your oven and stone is really hot. Be aware that these are my oven settings yours can be different so stay close when you start baking your bread adjust temperature or cooking time if needed. When the dough is proofed pick up a pita bread and turn it upside down before you put them on the pizza stone. The pita will bake more evenly and the top and bottom pita wall will be just as thick. Do not crowd your pizza stone. I can fit two pita breads on my stone and put them in the oven. Bake between 3 to 4 minutes. Because you let the oven warm a little langer the bread will puff up from the first pita bread. 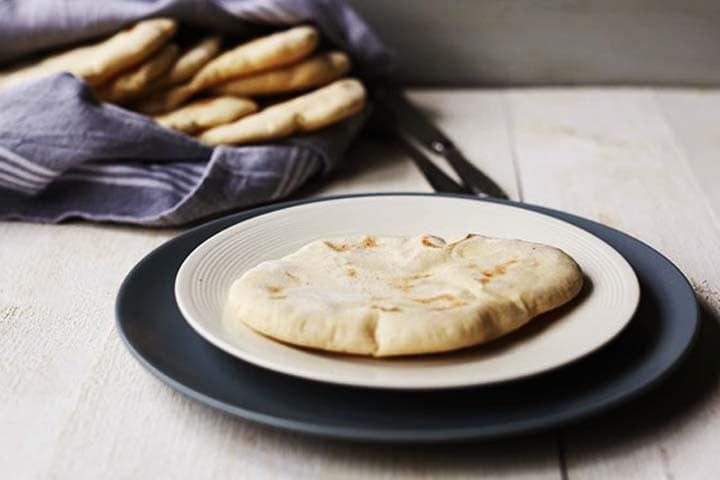 If you do not let the oven warm a little bit longer it will take the first pita longer to cook and puff up. When the pita breads are baked and out of the oven put them in a clean kitchen towel to keep warm. Putting them in a kitchen towel will prevent the pita from drying out. Then heat a cast iron skillet until really hot and char every pita in about half a minute per side. Either serve the bread immediately or let them cool so you can store them. Outside the fridge – if you want to eat the bread within 1 or 2 days you can put them in a closed plastic bag outside of the fridge. The plastic will prevent the bread from going dry. Fridge – you can also put them in a bag and store them in the fridge for a couple of days. Freezer – Want to keep them longer put your bread in a freezer bag and store it in your freezer for up to a couple of months. If you are going to eat them sprinkle some water on your bread and wrap them in aluminium foil. Set your oven to 400℉/200℃ and warm for about 5-7 minutes. 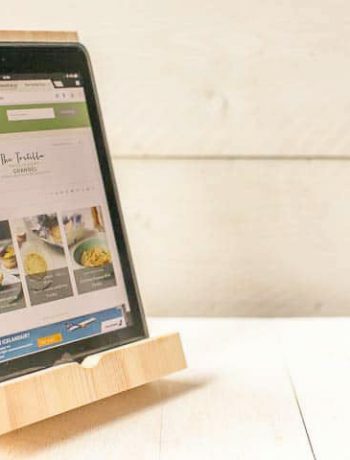 If you have a toaster you can use that as well. Do not set it to warm. Again sprinkle some water on the bread and toast for half a minute and check to see if it is warm. Delicious easy homemade pita chips – you can make pita chips for the weekend or on game night. 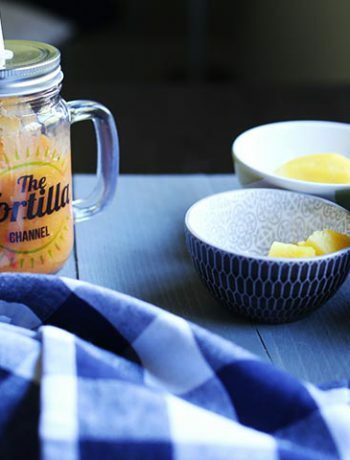 Combine with your favorite dips and you have a delicious but responsible snack! Hummus – pita bread with hummus is a killer combination. Make the hummus yourself you will be in food heaven! 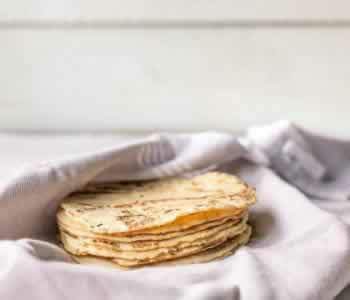 Have fun with this how to make pita bread recipe! Made a recipe please tag @thetortillachannel on INSTAGRAM, PIN on PINTEREST and like us on FACEBOOK for more information and update. 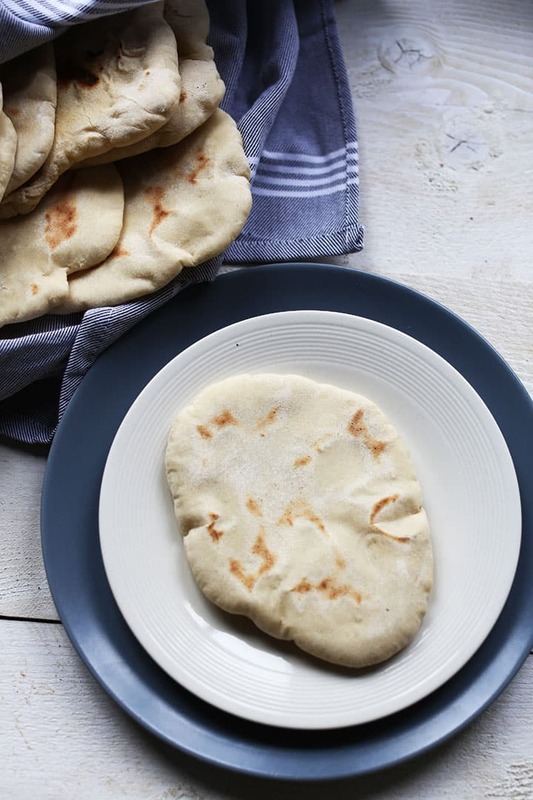 Making the best pita bread at home is easier than you think. 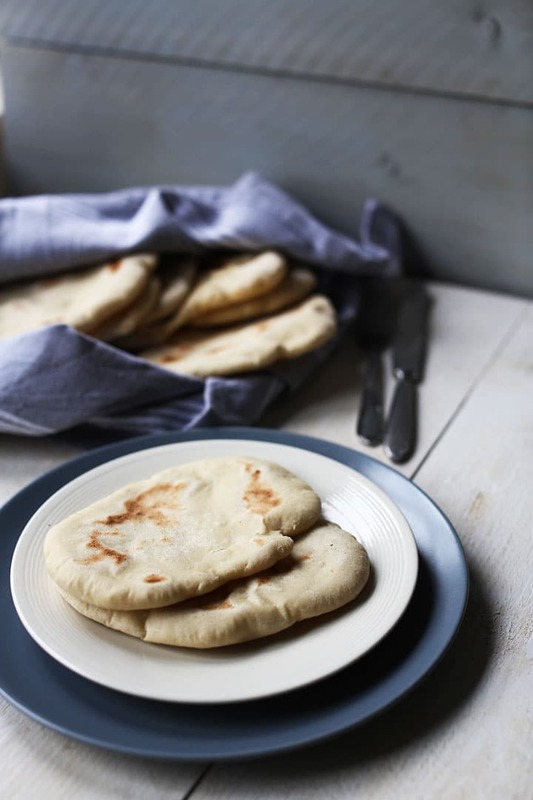 This pita bread is fluffy and soft waiting to be filled with veggies, meat or sauce. Take the dough out of the bowl and knead it through on a floured surface. Cut into 8 pieces and roll them into 8 inch pita of about ¼ thick. Cover with cling film and a wet towel and let it proof for another 25 minutes. 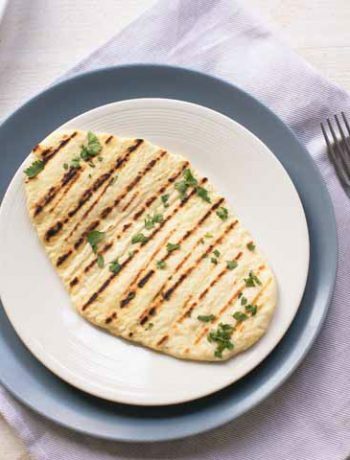 I’m curious … after baking the pita in the oven, you char them on the stove in a cast iron frying pan TOO? Yes I do. After 3 to 4 minutes in the oven the pitas are still a little pale. To give them some color, I heat my cast iron skillet on high heat and put the pita in for about 30 seconds per side to give them some char patches.